For the seventh year in a row, LogRhythm is positioned in the Leaders Quadrant. 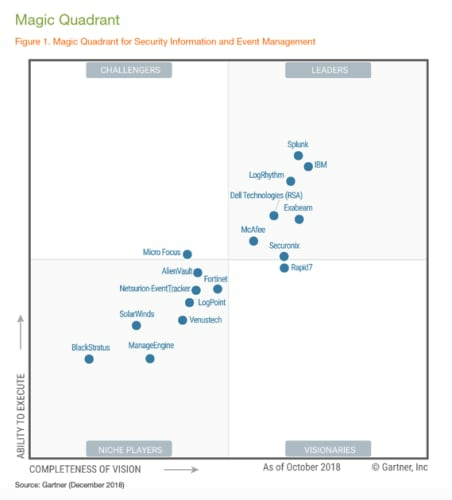 In the 2018 Magic Quadrant for Security Information and Event Management (SIEM), Gartner evaluated LogRhythm and 16 other vendors for completeness of vision and ability to execute. Read the full report for Gartner’s comprehensive analysis and SIEM vendor comparison evaluation. This graphic was published by Gartner, Inc. as part of a larger research document and should be evaluated in the context of the entire document. GARTNER is a registered trademark and service mark of Gartner, Inc. and/or its affiliates in the U.S. and internationally, and is used herein with permission. All rights reserved. ©2018. Gartner, Magic Quadrant for Security Information and Event Management, Kelly Kavanagh | Toby Bussa | Gorka Sadowski, 3 December 2018.